(Newser) – The 96-year-old surgeon credited with developing his namesake Heimlich maneuver recently used the technique for the first time himself to save a woman at his senior living center, reports AP. 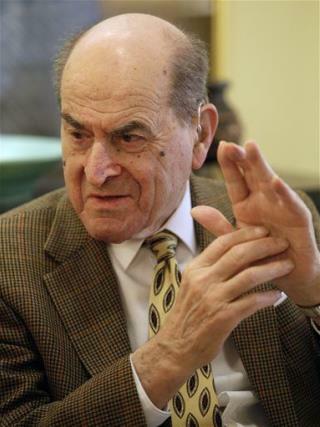 Dr. Henry Heimlich tells the Cincinnati Enquirer that while he had demonstrated the well-known maneuver many times through the years, he had never used it on a person in an actual emergency. Little old ladies' cracked ribs and broken backs speak for themselves. I speak from my mother's personal experience in a high-class restaurant with its local hero, the mental defecater. Take this to the bank, and without having to buy some extra garbage for your trashcan or go through a goofball learning curve: When your relative or friend is choking, scream at him to breathe through his nose! The choking will cease, allowing the food to descend naturally through his throat. Meat eating is as closely associated with development of cancer as cigarette smoking is. See "How Not To Die" by Dr. Michael Greger.